The Honda Accord is totally redesigned for 2003. It features new 4- and 6-cylinder engines with new transmissions, a more modern exterior, a higher quality interior, and improved handling. The Accord Coupe EX V6 model is now available with a 6-speed manual transmission. 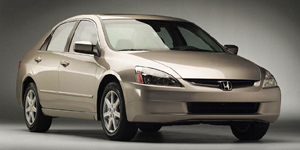 The 2003 Honda Accord Sedan is powered by a base 2.4-liter Inline-4 with 160 hp. Also available is a 3.0-liter V6 with 240 hp. The 2003 Honda Accord Coupe is powered by a base 2.4-liter Inline-4 with 160 hp. Also available is a 3.0-liter V6 with 240 hp.